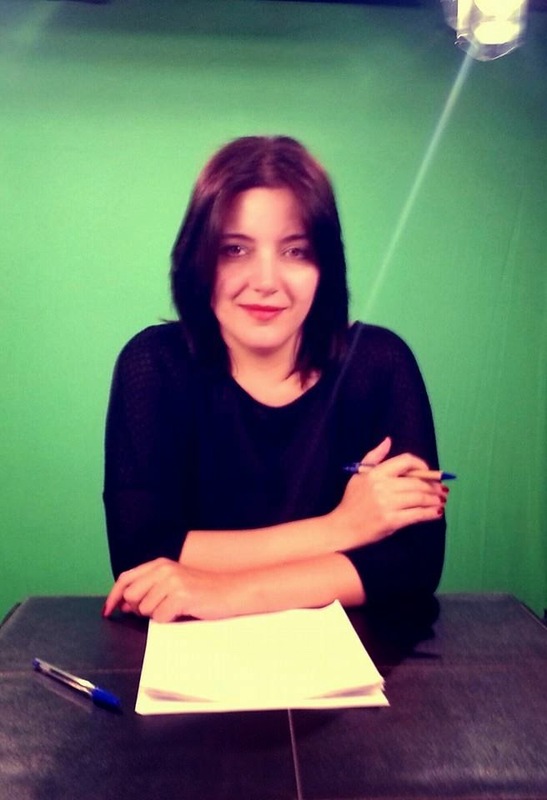 My name is Ghazal Salah, majoring in Journalism at the American University in Dubai. I love art because I can get the chance to share ideas and information through it. Furthermore, I love art because it is a universal language and there is no barrier when it comes to it. The title of my project is “In The Eyes of Muslims”. 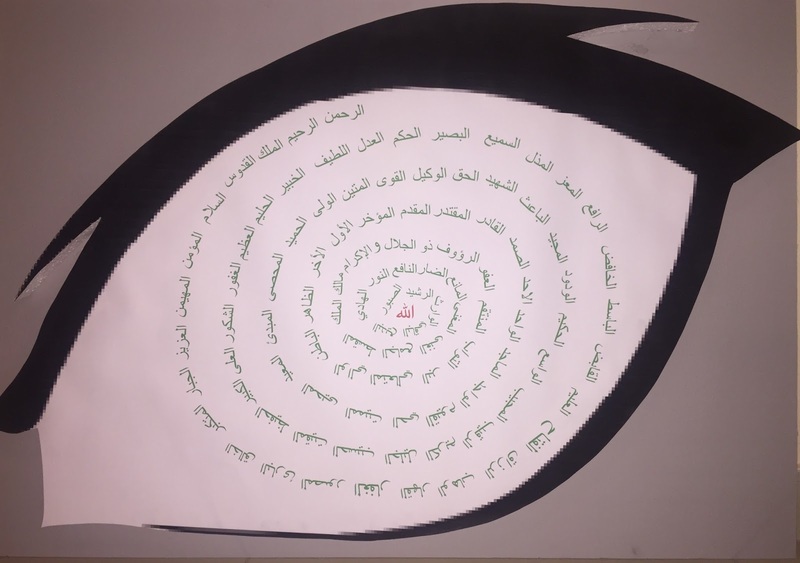 It is an eye that has the 99 names of God in order to show how God is seen by Muslims as Ghafoor, Raheem, Kareem, Al Salam, Al Mumin, and many other names that reflect God’s traits. I drew it on a PowerPoint and printed it on a big poster. I made sure that the names look like a whirlpool and the eye is three dimensional. Furthermore, I chose the words to be in green since it symbolizes safety and paradise, and the word Allah in red since it symbolizes love. For what is and what was. O you who believe please give thanks to Allah. The 99 names of God show and prove that Islam is not the way it is perceived as a religion of terrorism. However, when people look deeply at the meaning of each and every name, he or she will realize that it is a religion of peace. All names come together to form one meaning that is the core of Islam is peace. Moreover, the root of the word Islam means peace. The world has come to a time where Muslims are the first suspected to cause terrorist acts, and this has converged the thoughts of communities towards despising Muslims and having the desire to band them from living in their own society. These societies are missing the bigger picture and are not familiar with the true meaning of Islam. From these names we can understand Islam more. Islam teaches us to forgive each other, to be generous, to help each other, to be merciful, and many other lessons. Islam aims to build a society full of peace, serenity, justice, and friendship. When we think deeply of the each and every meaning of the 99 names of Allah, we find that there is no one name that stands for force and violence. Rahman and Rahim are the first two names of Allah that are compassionate and merciful. These two primary names of Allah specifically deal with Mercy. These two names frequently occur together in the Qur’an. Furthermore, they signify a flood of mercy that covers us and that is endless. They are both derived from the same root word rahmah which means mercy and also has elements of sympathy, kindness, gentleness, compassion and love intertwined with it. The mercy we see in this world which Allah has put among His Creation is just a hundredth of all His Mercy. Therefore, Allah manifests these qualities to the most perfect level with His Creation. Some other Names of Allah that are related to His Mercy are Al-Karim (the Generous), Al-Halim (the Forbearing), Al-Barr (the Generous), Al-Jawwad (the Bestower of Good), Al-Rauf (the Kind) and Al-Wahhab (the Bestower). Examples of mercy that we see in His creation includes the love a mother has for her child (or love towards each other), the eyes with which we are able to see, the food which we are provided to consume, the generosity and kindness we show to others. I was influenced by a Libyan student at the American University in Dubai, Mowada Arifi. 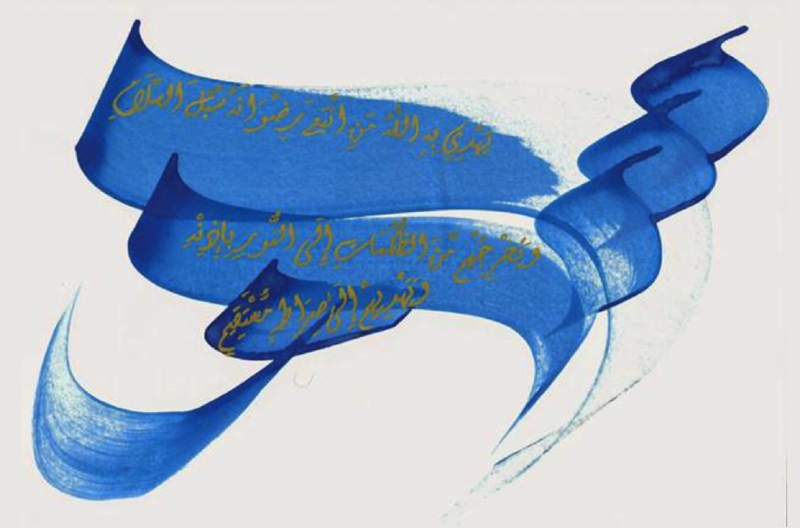 Her painting had a sentence which is “Allah Kareem yohebo al karam”. Her message was to show God’s trait which is generosity, and to show that generosity and Islam lead to peace. As for my artwork, I did not want to specify one trait. Therefore, I included the 99 names of God that reflect his traits.